People are watching. What will they see you doing? People are listening. What will they hear you saying? Will they see you walk your talk? I like to see everything around me clean, neatly arranged, and in the proper place. That is what I have preached for years. My entire adult career was in the food service industry. Clean, neat, orderly, uncluttered, polished, swept and mopped are all words that I constantly used for 57 years. Those words were meaningless without matching action. In fact, they became so much a part of me that the action came with little or no effort. Some would say I practiced what I preached or that I was authentic. Constantly, I was teaching, coaching, and encouraging those around me to keep the restaurants and parking lots clean and uncluttered. 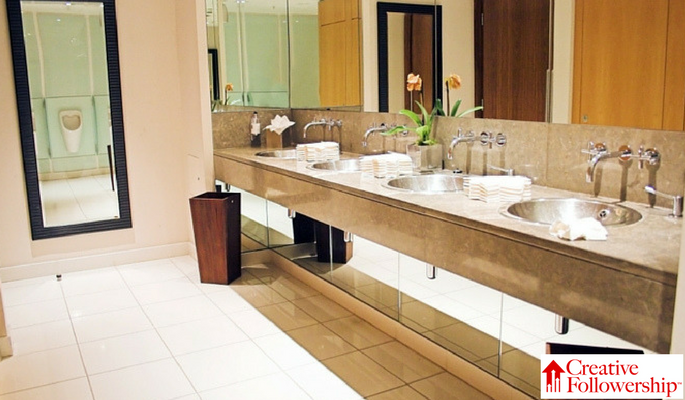 In the food service business, from the customer’s viewpoint, the most important place to keep clean is the restroom. Customers usually can’t see what the kitchen looks like, so they use the condition of the restroom, which they can see, to judge the cleanliness of the kitchen. Over time, you might say I became a clean restroom fanatic. Many years ago, while visiting a man in Crawford Long Hospital, I went into the men’s restroom in the waiting room. There were paper towels all over the floor, sinks and counter; the wall mirror was splashed with soap; the paper seat covers were scattered everywhere; the trashcans were running over. It looked like a tornado had just passed through! Another man had followed me through the door. I thought, “What a mess!” Rather than just walking out and leaving things as they were, I got to work. I started picking up towels, seat covers and trash. The other man saw what I was doing and began to clean the wall mirror, counter top and hand sinks. When everything was tidied up, we washed our hands, smiled at each other and left. Not a single word was exchanged! We were both satisfied with the results. As I have looked back on that incident, I have often wondered if he would have cleaned that restroom if he had been alone or he had not seen me start cleaning. I will never know, but I do know that encouragement by example works!